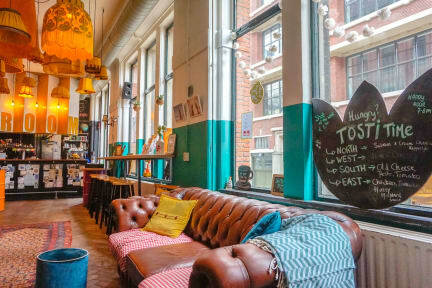 Hostel ROOM Rotterdam i Rotterdam, Nederland: Bestill nå! Great hostel! my friend was so exited by the place that he wants to start his own hostel. We were part of their 10 year celebration and we had a great time. The staff was very friendly, the biggest dorm is very spacius so no problem staying in that room. The most friendly straff we have come across during our backpacking trip to Europe. The hostel felt very safe due too the door being locked, and the guest having to be buzzed in by the staff. Great commonroom with an amazing athmosphere. The staff arranged daily happenings in the commonroom, wich made for a great way to meet other people. We only stayed there for one night, but would definetly come back, and reccomend it to anyone visiting Rotterdam.